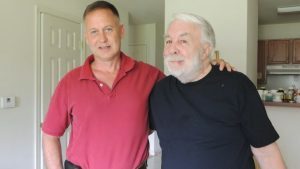 Peter stands with David Benhoff, LtCol, USMC Ret., co-founder of Hero’s Bridge, in his apartment living room. Eighty-seven-year-old Korean and Vietnam veteran Peter lives very simply. His one-bedroom apartment is furnished with only a sofa, rocker, and a recliner that he recently received. There are a handful of books lying on a few tables. There is no television. The recliner faces a large picture window that looks out of the first-floor apartment onto a small lawn. Peter lives on a tight budget: $1,100 monthly, most of which goes toward paying his rent. Peter’s wife has passed away and his family lives on the West Coast. Peter does not complain, but rather simply states the facts. He has had two major operations for cancer on his jaw, with another one scheduled. Even though he suffers from several maladies, when asked by his doctor how he is, he will answer that he is doing well. Hero’s Bridge was created for people like Peter. David Benhoff, LtCol, USMC Ret. and Molly Brooks, RN-BC, CHPN, created the nonprofit organization to improve difficult circumstances for veterans who served their country and fought for freedom worldwide. Battle Buddies is one program Hero’s Bridge offers, which pairs aging veterans with their younger comrades to help assess their needs, help with transportation, and provide companionship. Phil Kasky, Captain, USN Ret. is a Hero’s Bridge Battle Buddy volunteer; “My wife, Mary, was with me at [the VFW Post 9835] meeting and Molly and Dave’s comments resonated with us, especially the importance of Battle Buddies and how together, we might make a difference in an old veteran’s life.” Benhoff connected the Kaskys with Peter. “We feel it is both a duty and a joy to help Peter, and even the smallest of things can make a big difference to an aging veteran such as Peter who no longer has the mobility of a younger man. Mary and I visit Peter weekly, we make occasional grocery runs for him, help with errands and assist with local transportation needs. Our friendship has grown and he has become important in our lives. We have become important in his life as well,” says Kasky. While the organization is still in its infancy, veteran members, like Peter, appreciate the effort made by Benhoff and Brooks and offer suggestions on the areas where improvement is needed. Hero’s Bridge is committed to growing the programs offered by their nonprofit organization to serve this great generation of veterans during their twilight years. Benhoff and Brooks are hoping to grow the number of volunteers involved with Hero’s Bridge as the list of participating veterans grows. Benhoff is confident that through collaborations with other organizations in the Piedmont region, the group will gain momentum and improve the quality of life for our community veterans. If you know of a veteran who would like to join Hero’s Bridge, please call 540-993-6386. To register as a volunteer, please visit the Hero’s Bridge website at www.herosbridge.org. You may also follow them on Facebook. This article originally appeared in Warrenton Lifestyle Magazine in the July 2017 publication and is published on this website with the publisher’s permission. To view the original article visit www.piedmontlifestyle.com.